Weight loss is one of the most common fitness goals, but there are so many awesome goals that go beyond weight loss. We live in a world where we are inundated with slim, attractive people everywhere we look. They’re in magazines, on television, on billboards, on digital ads, in movies, etc., and when you consider the fact that more 160 million Americans are either overweight or obese, it’s no wonder why weight loss is the most common fitness goal Americans strive for. However, the fact of the matter is the number on the scale is just that — a number. It’s not an indicator of how strong or healthy you are, and it shouldn’t be the only fitness goal you focus on. 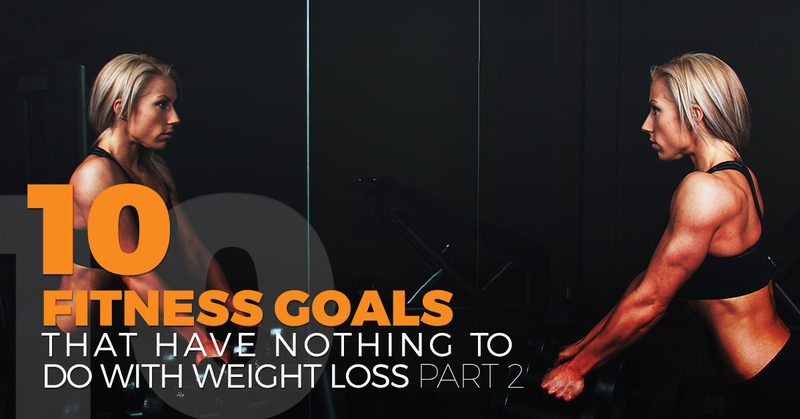 That’s why, in Part 1 of this series, we went over five great fitness goals that have nothing to do with weight loss. Keep reading to learn about the last five. #6. Stay consistent for a month. Regardless of what you hope you get out of your fitness routine, staying consistent with it is the only way to get the results you want. But, unfortunately for many of us, consistency is actually the most difficult part. When you decide to stick with a workout routine or a nutritional program, there will always be a million reasons not to do it or to give up. That’s why making consistency your goal is so powerful. If you can learn how to stay consistent, there’s no fitness goal you won’t be able to crush. So, for just one month, put all of the excuses aside and stick with the program. After the month is complete, your workout will be a part of your routine, and it will be easier to stick with. Once you have a routine down, it’s easy to stick with it without ever pushing yourself to do more or questioning how effective it is. Like we mentioned in our last point, above all, consistency is key, but if you’ve been doing the same old routine over and over and over again, sooner or late, you’re going to stop making progress. Once you’ve mastered your regular routine, you become so efficient at doing it that you no longer have to push yourself as much as you used to, and you won’t get the same benefits you previously enjoyed. Trying something new will help you to break out of your shell, use different muscles and continue to see progress. For example, if your routine consists of going for a run and lifting dumbbells, go on a hike or take a yoga class. If your routine consists of pilates and doing the elliptical, try boxing or lifting weights. Don’t be intimidated by those beefy guys that infiltrate the gym. Weight training isn’t just for men who are obsessed with the size of their biceps; it’s something that can benefit EVERYONE. Lifting weights is one of the best ways to get stronger, making it easier to perform everyday activities. But, it also helps to prevent bone loss — decreasing your risk for developing osteoporosis — builds muscle that supports the joints, promotes fat loss, increases metabolic rate, improves posture, reduces stress, decreases depression and so much more. 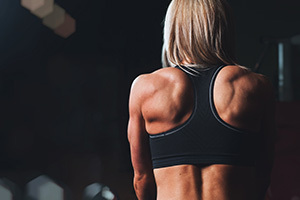 There are so many reasons to start lifting weights, so if it’s not already a part of your fitness routine, including weightlifting is an incredible goal. #9. Push yourself out of your comfort zone. When you first start working out, it’s easy to make gains and see results. But, after a while, the gains start becoming smaller and smaller until, eventually, you’re just working to maintain instead of working to get better. Pushing yourself isn’t always easy to do, but it’s essential if you want to keep seeing results and keep getting stronger. For example, if you love to go on longer runs where you keep a consistent pace, try adding in two-minute intervals of sprinting throughout your run. If you’re used to doing two sets of eight bicep curls with 20-pound weights, try doing two sets of four bicep curls with 30-pound weights. By continuously pushing yourself and changing up your routine, you’ll avoid the dreaded plateau, and you’ll have what it takes to reach any other fitness goal you set your mind to. #10. Drink plenty of water. Drinking enough water sounds simple enough, but one study found that 43 percent of Americans drink fewer than four cups of water per day, and that seven percent of Americans don’t drink any water at all. Experts used to recommend that we drink at least eight glasses of water every day, but they now recognize that water needs are more individual. The amount of water you should drink every day depends on many factors, including how active you are, the climate you live in, how many water-rich foods you eat, etc., but it’s safe to say that a lot of Americans don’t drink as much as they should. And, since dehydration can cause your physical performance to take a huge hit, it’s definitely a smart move to making drinking more water your fitness goal. There are so many incredible fitness goals that you could shoot for that have nothing to do with weight loss, and with the Goal Plus fitness accountability app, you’ll have all of the tools you need to reach that goal right in your smartphone, and best of all, it’s free! 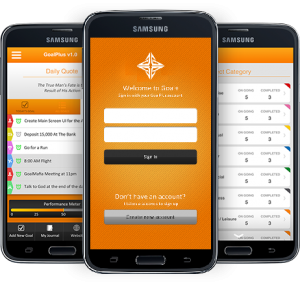 Take the first step towards reaching your goals by downloading Goal Plus today.